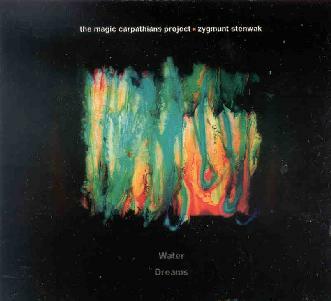 The Magic Carpathians & Zygmunt Stenwak - "Water Dreams"
The latest release by Poland's (if not the world's) premier ethno-experimental-folk-psych band has for its' theme the art of the co-credited photographer (who does not play on the album). This digipak release contains a glossy color booklet glued in, with ten of his photographs reproduced. Stenwak's photos are notable enough in themselves, not being recognizable as any real object, and obviously have been subjected to some major darkroom (or computer?) manipulation. If anything, they're even more radically colorful and overtly lysergic than the music on the CD, with 20-plus instruments employed by the four band members and its deeply-tranced psychedelic headspaces. Fine viewing to accompany the listening, although there's no match between the song and photo titles. "Something You Can Hide In" leads off with a harmonium drone, and operatic vocals from guitarist Anna Nacher, suddenly giving way half through its' 13-minute length, into what can only be described as a funky raga, at which point Nacher's voice shoots into the stratosphere, as eerily witchy as the best of Gilli Smyth, less space-whisper than space-scream (like an only slightly subdued Diamanda Galas), and ends with pleasently melodic figures from guest violinist Patrycja Kujawska. Repetitive musical themes figure throughout the album, from the percussive loop and rhythmic bass synth squelch of "Distance", to Taomasz Radziuk's jazzy bass drive that underscores (beneath clarinet squeal, rattling percussion, and spoken voice) most of "Triple Portrait". "Response" is credited with a backing track by Cerberus Shoal, which is perhaps what the piece *is* a response to. It's not clear exactly what comprises the backing track, but on an album where every piece is eerie and atmospheric, this one excels on both accounts. Very spooky and ambient, probably appealing to fans of Current 93. The closing track, "Continuum", is another perfect space-folk raga, with overlaid violin, sitar, and vocal drones over a solid bass line. Overall, the Carpathians certainly succeed at creating sonic art analagous to Stenwak's photos, and both artists have clearly created works that excel in their individual fields. For more information you can visit the Magic Carpathians web site at: http://www.karpatymagiczne.vivo.pl/karpatymagiczne. It's in Polish but you'll still understand a lot of the essential information.